Q. What is a SWOT Analysis in Business? Use Credo Reference Books to locate a definition and general information about SWOT analysis. Simply type in SWOT to pull up dictionary and encyclopedia entries from business encyclopedias. This SWOT Analysis article should be helpful for getting started. 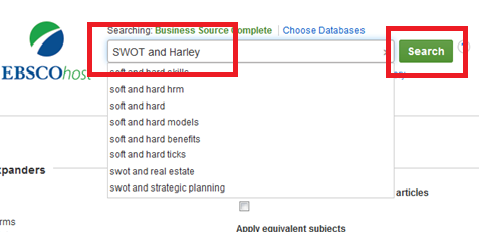 In Business Source Complete, type in SWOT in the search box, and hit the search button. To narrow the results down to actual SWOT analyses, use the limiters on the left side of the screen. 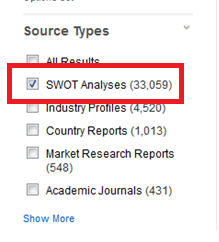 Under Source Type, check the box next to SWOT Analyses and click update. To see a SWOT for a specific company, type the name of the company and the word SWOT in the search box.